New Delhi: The second volume of Economic Survey 2016-17 presented on Friday signalled the reduced heft of crude oil prices in India’s national economic policymaking. “It has become almost an involuntary reflex to cite geopolitics in the list of risks to oil prices, and hence to domestic inflation. But these risks may well be diminishing substantially," the Survey said. “The oil market is very different today from a few years ago in a way that imparts a downward bias to oil prices, or at least has capped the upside risks to oil prices," it added. This is a marked shift from the survey’s cautionary stance in January on rising oil prices presenting a challenge to India’s growth, as articulated in its first volume. “Some possible challenges to growth exist. For example, the prices of crude oil have started rising and are projected to increase further in the next year. Estimates suggest that oil prices could rise by as much as one-sixth over the 2016-17 level, which could have some dampening impact on growth," the Survey had said on 31 January. The importance of crude oil prices in the policy space stems from India’s oil and gas import bill, which was Rs4.16 trillion and Rs43,782 crore, respectively, in 2015-16. However, this is set to change with the National Democratic Alliance (NDA) government’s ambitious plan for a mass shift to electric vehicles by 2030, so that every vehicle on roads by then—both personal and commercial—is powered by electricity. Also, India has started selling petrol and diesel in sync with global rates from June as part of the strategy to completely overhaul the retail market. Experts remained circumspect. “There is a view that oil prices will be down for a longer time. However, it is better to look at demand rather than prices," said Saurabh Chandra, former petroleum secretary. 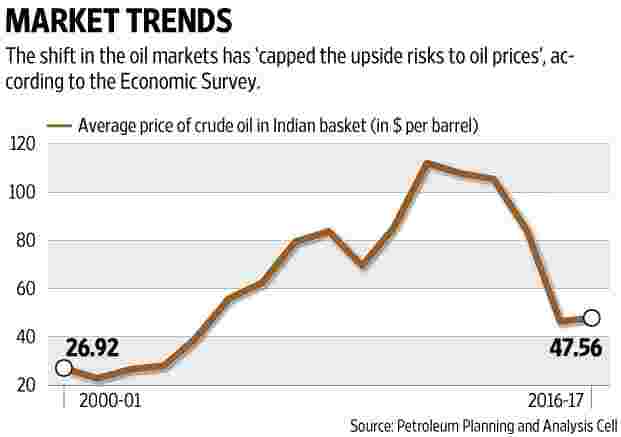 The average price of crude oil in the Indian basket has fallen from $52.49 per barrel in April to $47.86 in July. The price was $51.82 per barrel on Thursday. “In sum, geopolitical risks are simply not as risky as earlier. Technology has rendered India less susceptible to the vicissitudes of geo-economics (OPEC) and geo-politics (Middle East). If, and to the extent that changes prove permanent, the consequences for the inflationary process need to be taken into account," the Survey said. India also has a very important role in the global energy market. China and India accounted for half of the 1% growth in global energy demand in 2016, according to the BP Statistical Review of World Energy. India maintained its energy demand growth at 5.4%. “The only certainty is uncertainty in the world of oil. It is only a brave man who will take a call on oil prices. In 2008 they fluctuated between $32 per barrel to $145 per barrel," added Chandra, who also served as secretary in the department of industrial policy and promotion. Subdued global crude oil prices due to new technologies, US shale gas and supply of oil from non-Organization of the Petroleum Exporting Countries (Opec) countries have also led to Opec’s influence over India waning. “Going forward, therefore, it is not that oil prices will not be volatile. Nor is it the case that they will never rise above the $50 ‘ceiling’. Rather, shale technology will ensure that prices cannot remain above this ceiling for any prolonged period of time because of rapid supply responses which will take the prices toward the marginal cost of production of shale. The dramatic decline in the cost and prices of renewables will only reinforce this tendency," the Survey said.